How Much Time And Money Does It Take To Create Great Content? By now, you’ve probably learned about the merits of creating quality content on your website and how “long form content” helps you attract links, social media shares, and separates you as an authority from your competitors. And while I see many people talking about why you should create quality content, I don’t see many people sharing how to create it, what their process is for creating it, and how much time and money it actually takes. Before we start, please understand the term ‘great content’ is a subjective term. We worked hard on the client post we’ll be discussing here and feel it’s our best work. Perhaps we’ll improve it later, but for now, we think it’s pretty darn good and hope you agree. We welcome your comments at the end of this post. 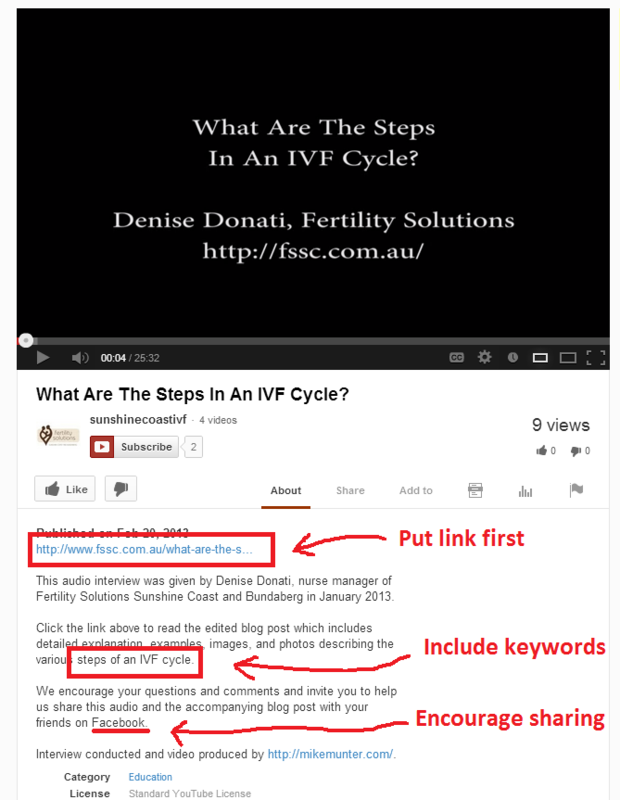 Recently, we worked together with our client Denise Donati of Fertility Solutions Sunshine Coast, to create What Are The Steps Of An IVF Cycle. We wanted to create something that would educate prospective parents and give them a good understanding of what it’s like to go through an IVF treatment cycle. The post, as of this writing, contains 3,267 words, 11 images, 13 questions, 5 headers, 5 internal links, 1 call to action and 1 external link to the accompanying Youtube audio of the original interview with Denise. The post is optimized for search engines based on commonly recognized best practices. It was styled in WordPress for eye appeal and ease of readability. Let’s walk through the process together step-by-step, so you can see how we did it. I encourage you to open the post, so you can follow along. I don’t like the first option because it’s not authentic. I prefer to get information from the source. No writer knows this subject better than my client – she is the one in the lab, working on this every day. And paying outside copy writers gets pretty expensive really quick. With this topic, I didn’t feel hiring a copywriter was the best option. As for relying on your client to provide the seed content, there are two problems with this. One is that they usually don’t have time to do it. And even if they did, I wind up spending hours going through it and having to ask a lot of questions anyway. I’ve tried this approach before and find it to be frustrating and very time consuming. This is why I decided to start interviewing clients in order to get the the content we need to form a killer blog post. As a layman in the field, it allows me to interject questions, so I understand the subject matter. I figure, the better I understand it, the better I can communicate it. Plus, the recorded audio can be re-purposed as a podcast. 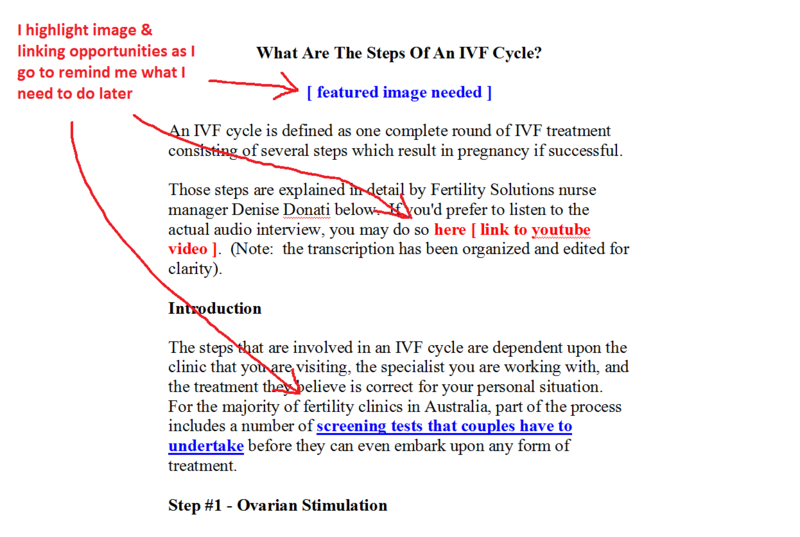 Prior to our interview, Denise put together a brief outline of the IVF cycle steps and sent it to me. We conducted the interview via Skype and I recorded it using the free Pamela software. Even with the call being international, (I’m in the United States, Denise is in Australia) Skype’s call quality is pretty good, with only a few glitches. Listen to the audio and see what you think. Next, I had the audio transcribed at a cost of $1/ min. The full interview was 28 minutes and the transcription I received was near perfect. I used Datalyst for the transcription. Organizing the transcribed interview and writing the first draft is what took the most amount of time. 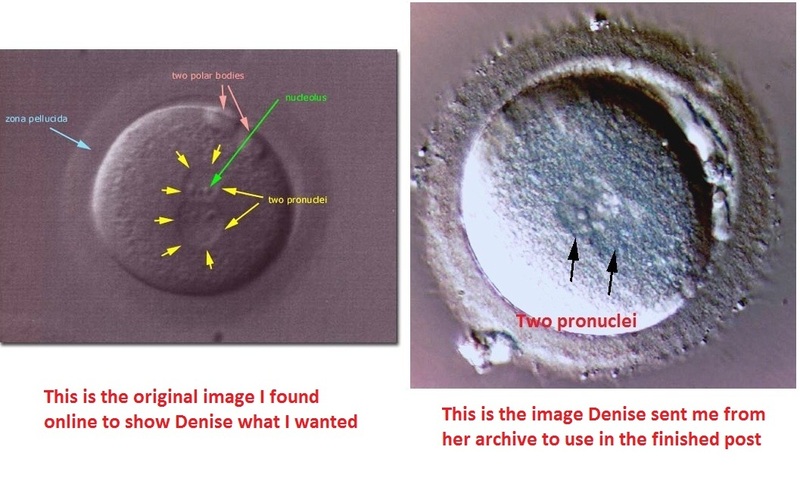 Being a marketing guy, I’m not very experienced in the field of IVF, so this part of the process took me a while. I’m also not the best writer – it takes me time to shape my thoughts and communicate things in a way that is easy to understand. I suspect a professional copywriter could produce the work in less than half the time it took me. Alas, I spent a full day working with the transcription, editing it for clarity and re-writing some of the areas that needed skimming down. If you listen to the audio and compare it to the actual post, you’ll see where I made changes to help clarify the points Denise made. As I prepared the first draft, it became clear where potential internal linking opportunities might be on the Fertility Solutions website. It was also easy to see where opportunities were to link out to future blog posts (we’re already planning an interview with a scientist at FSSC to discuss the topic of ICSI). I began inserting questions and headers to break the content up into more digestible chunks of about 2-3 paragraphs each, knowing that we’d have several images to help further break up the extensive amount of words. Included in the time below is my time spent emailing back and forth with the client to clarify certain points and verify the IVF cycle timeline to make sure that what I was writing was 100% accurate. Once the copy is laid out, it starts to become easy to see where images are needed to help explain key points and break up the flow of words, so the finished product is easily understood and aesthetically appealing. Of the 11 images in the post, 3 of them are purchased, 7 are client supplied, and 1 was created by me. 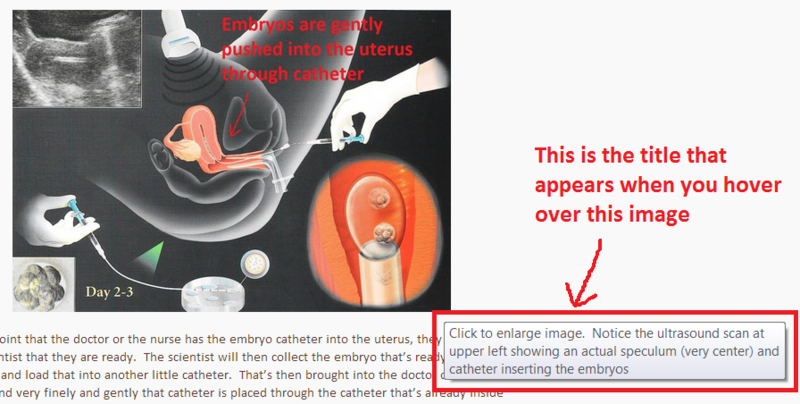 Most images had to be re-sized to look good and eight of them were marked up with additional instructions and arrows ( in red) to help the reader better understand what they’re looking at. Another thing I try to do when I mark up photos is to present new information or say something different than I’ve already said in the text. Simply re-hashing the same thing doesn’t add much value. While marking up your images takes time, I feel it’s a fantastic way to connect with your reader. One of the images is a custom graphic I created using the free Paint.net program. I feel this “Attrition Chart” helps explain what happens to eggs and embryos as the IVF cycle progresses. While I’m not a graphic designer, I think the picture gives you a decent idea of what happens during a typical cycle of IVF. 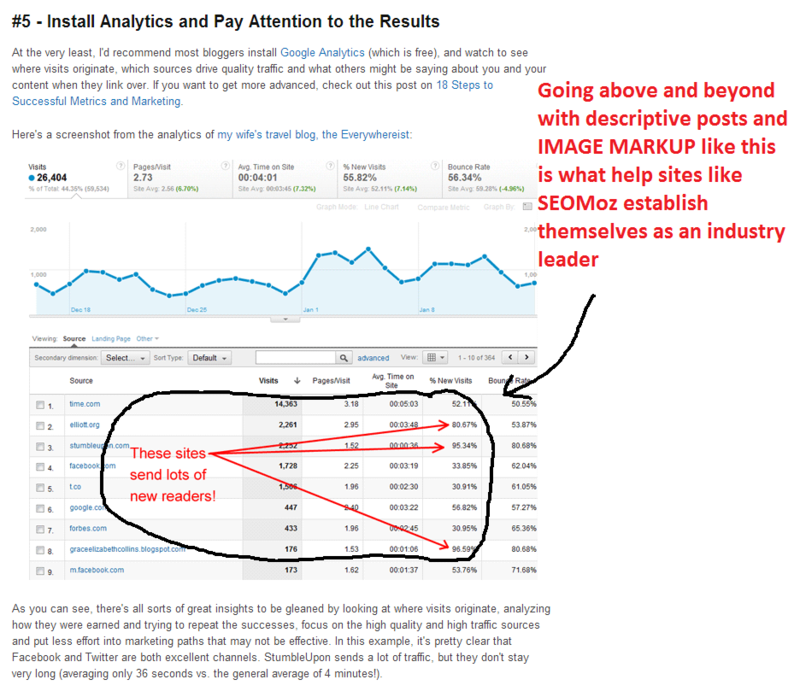 Of course, each image was optimized with “alt tags” to help Googlebot read them. Where appropriate, titles were added to provide additional direction for the user. Expense: $4 for 3 images we purchased from 123rf.com. I produced the video on youtube using Adobe Premiere Elements 11. I bought this program a few months ago after learning Windows Movie Maker doesn’t work well with my new computer operating system, so I’m still really new at it. I don’t fashion myself as a video editor, but I know enough to get simple slides made, drop-in music and trim audio clips to cut out the rough spots. I’m certainly not bragging about the pizzazz of the video. I produced and published it so people could listen along as they read and hear Denise talking about the field of work she loves: IVF. My thinking is that people want to make a connection; so by hearing Denise’s voice, potential clients can get a sense of her expertise by listening to her speak. Nevertheless, the video sits on Youtube where it might get found and produce a lead or two of it’s own. The intro/outro music loop was a free download and the few slides in the video were easy to create. I uploaded it to Youtube and optimized the description. My initial thought was to create a podcast, but since this is not already setup on Denise’s site, I decided against investing further time. I didn’t think the return on time investment would be worth it. I got the idea to create the timeline bar and spent some time styling it to fit properly below each step’s heading. The timeline bar is just one more way to make the post look more professional and help to break up all those words. I cruised through the notes from my rough draft and identified the internal linking opportunities. WordPress makes it easy to find relevant posts to link to on your site – all you have to do is enter your keywords in the search box on the pages/post screen. I have 3 screens on my desk, which really helps me speed through the styling process. On one screen I open a browser with the working blog post in it; on another, I open the CSS stylesheet editor; and on my 3rd monitor I open the live preview, so I can refresh changes to make sure that what I’m doing looks good. I’m an average web designer at best, so working on the HTML and CSS back end take me more time than most designers, but I enjoy the work. I’ve already mentioned how I optimized images, so robots can recognize them. On the Fertility Solutions website, title tags and h1 tags are set to match the title of the post, so that happens automatically. I think it’s a good idea to only use one h1 header tag and I don’t like to over-use h2 header tags. 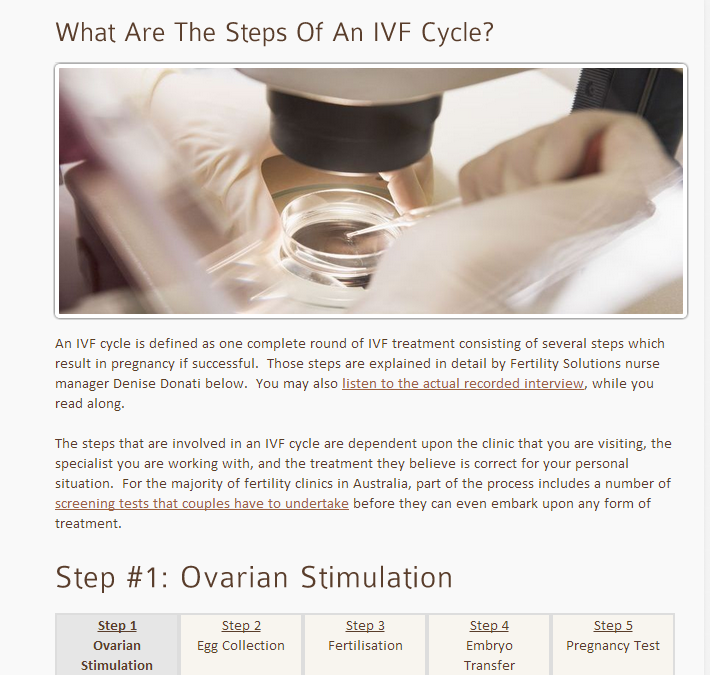 I could’ve set the h2 titles to include our “ivf cycle” keywords, such as “IVF Cycle Step #2: Egg Collection”, but that seemed a little spammy, so I just shortened it to the actual name of each step, i.e. “Step 2: Egg Collection”. For internal linking, I think I read recently on Quicksprout that their research shows people tend to click on links with about 7 words of anchor text. Good enough for me. I try to make all my anchors a bit longer now, it just seems like the right thing to do. For shorter posts under 2,000 words, I usually don’t write descriptions. I let Google pull what it feels is appropriate. In this case, however, since this piece of content is over 3,000 words and is one I feel can be a cornerstone of Denise’s site, I took the time to write a custom description, so when it appears in search results, searchers are more likely to click it. I proofed the post several times before publishing it. Then, as is my usual practice, I slept on it. The next morning I read it one more time to make sure it was free of mistakes, flowed well, and provides what Google’s head of webspam Matt Cutts would call a “good user experience.” 🙂 How did I do? Did I miss anything? I spent 14 hours and my client spent 1 hour on this post for a total of 15 hours. We had $32 in hard costs. So, the question now is “Is it worth it?” The answer today is, “I hope so, but we’ll have to wait and see.” There’s plenty of evidence out there to suggest our decision to invest in blogging and content marketing for Fertility Solutions is a wise one. It feels good to have created something that truly adds value to the internet. We’ve got a great post to hang our hat on and we’ve already got some good ideas on how to promote it. I’m hoping we’ve created a valuable reference guide that Denise’s target audience will bookmark, share, and return to for years to come. Because that’s what will help establish her company as the leader in their industry, help them build trust with new visitors to their site, and convert some of those visitors into new customers. In the end, creating the best possible content on your website takes a considerable amount of time and energy. Since I did most of the work myself, the investment in time is much greater than the investment in money. Had I hired a copy writer, video editor and graphic designer, my time would have likely been cut to about two hours, but my expense would have increased significantly into the hundreds of dollars. If you want to maintain a blog on your website, you might as well take the time to do it right. This post suggests several reasons why longer, more informative posts are the way to go, even if you can only create 1 each month. Remember, as the value of your business increases, your website is a big asset in the equation. Publish rich, useful content and you naturally begin to separate yourself from your competition. Subscribe to our blog posts below, so you don’t miss our future post, where we’ll cover how we marketed this post of Denise’s and the results we got.